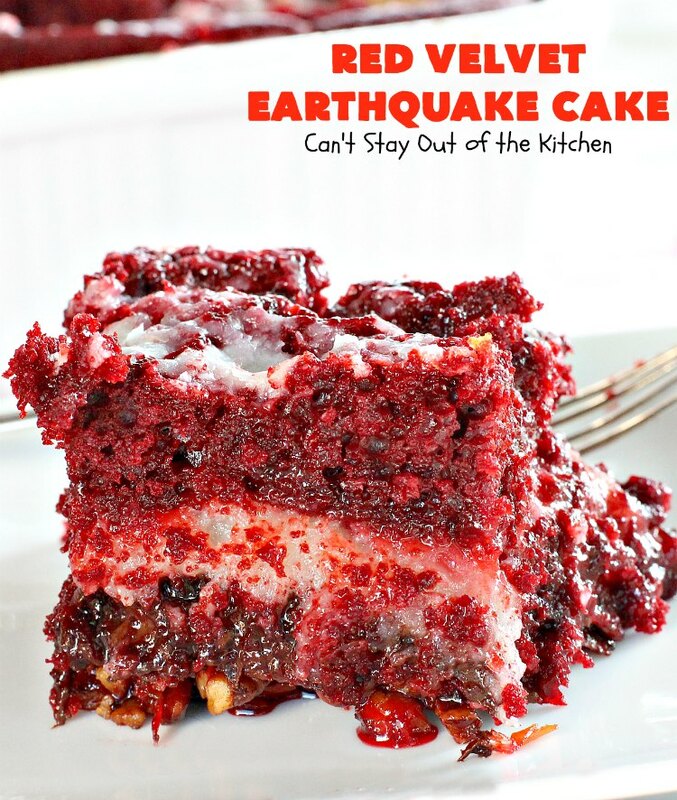 Have I got a spectacular dessert for you–Red Velvet Earthquake Cake. Let that sink in. 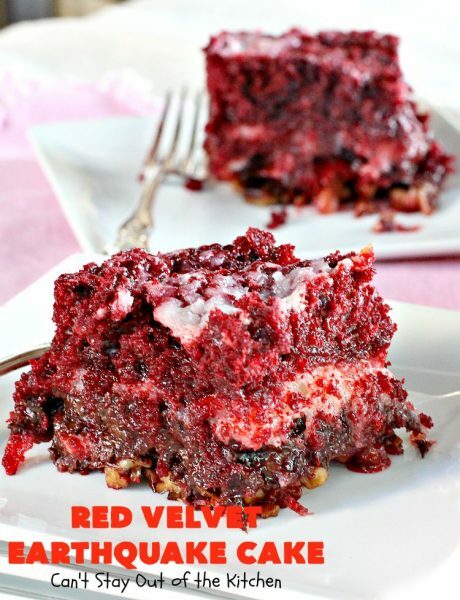 This luscious cake has coconut, pecans and chocolate chips on the bottom layer, then those ingredients are topped with a lovely Red Velvet Cake batter followed by a scrumptious cheesecake layer. This dessert is wonderful, and if you like gooey desserts (which I do), then you will find Red Velvet Earthquake Cake a dessert you will savor down to the last bite! What’s not to love about red velvet and chocolate chips, red velvet and cheesecake, red velvet and coconut, red velvet and pecans? It all works so well together in this recipe. 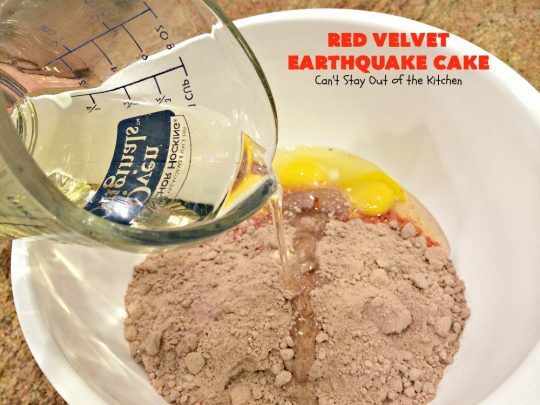 This amazing cake is a take-off on my Earthquake Cake. 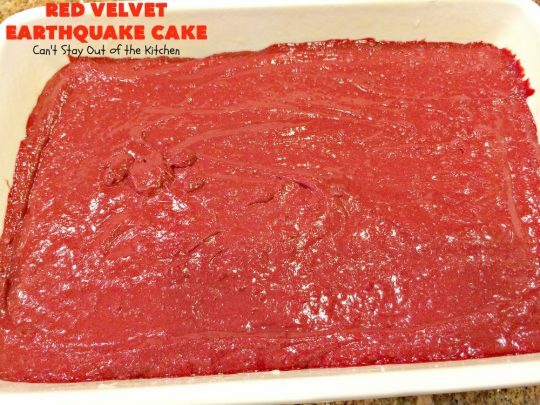 If that cake can be considered getting into the play-offs, Red Velvet Earthquake Cake is like winning the Super Bowl! It’s that fantastic. 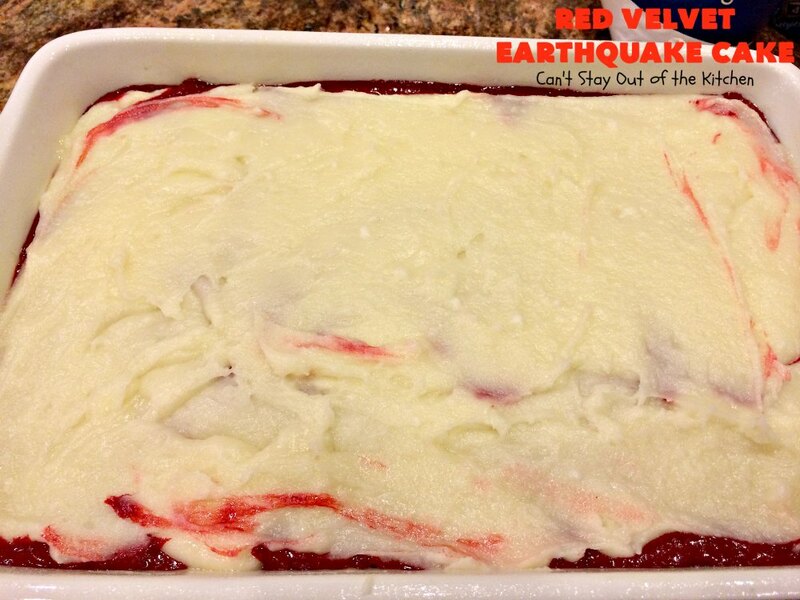 Red Velvet Earthquake Cake undergoes a seismic shift while baking so that everything becomes somewhat topsy-turvy. 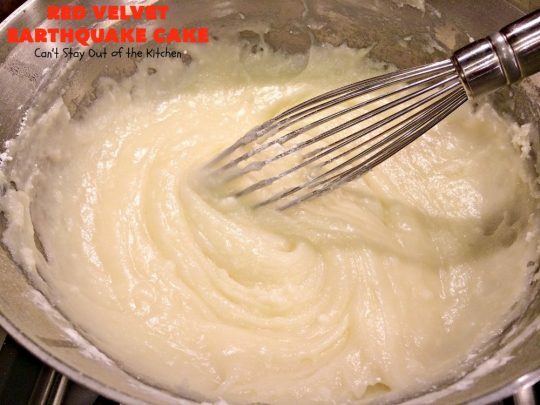 It develops cracks on the top of the cake which resemble an “earthquake,” and that’s how the cake got its name. Serve Red Velvet Earthquake Cake with chocolate sauce, ice cream, or whipped topping if desired, but I assure you, this dessert is rich and decadent enough just as it is! I baked up Red Velvet Earthquake Cake for some friends in our Sunday school class in August when she fell (with a grandbaby in her arms, no less!) and hurt her back (the baby was fine). I took a couple of meals to her which included this marvelous cake. She had her kids and some friends over and they all raved over this dessert. I’m not exaggerating when I say it’s one of the best desserts I’ve made this year. Yum. 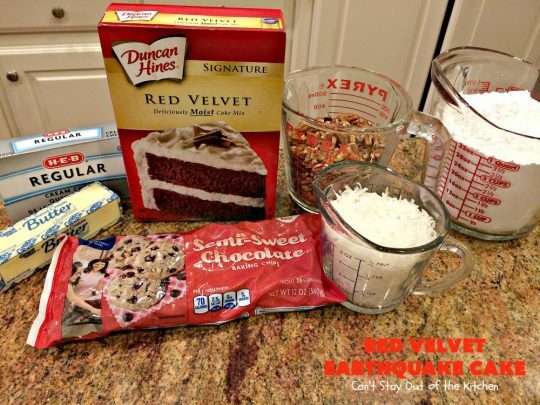 If you’re looking for a fabulous holiday dessert then Red Velvet Earthquake Cake has to be on the menu! It’s a great dessert for special occasions like Valentine’s Day, birthdays and anniversaries, too. Plus, it’s really not very difficult since it starts with a Red Velvet cake mix. 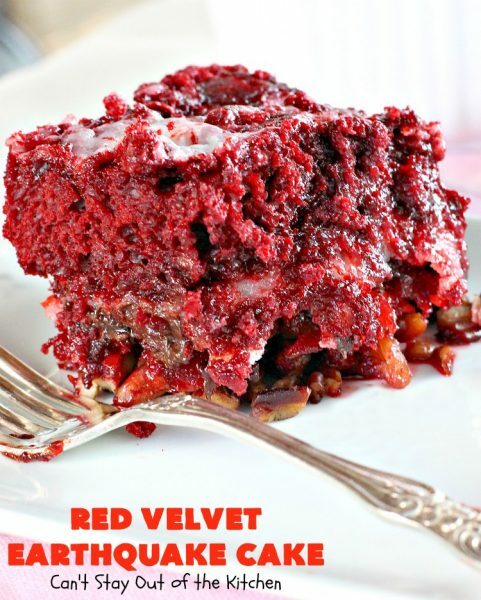 Everyone in your family will love this gooey dessert so I suggest buying a couple of boxes of Red Velvet cake mix while you’re at it so that you can make more than one of these terrific cakes. Red Velvet Earthquake Cake has been featured on Recipe Lion. Check out their posts, here and here. Red Velvet Earthquake Cake bakes differently in every oven. I’ve had people say their cakes were overdone at 45 minutes, and others tell me that their cake took as long as mine to bake – almost an hour and a half. 1) Cover with foil after 30 to 40 minutes of cooking time especially if you have a hot oven. This will prevent the cream cheese from browning too much. 2) Start checking your cooking time every ten minutes after the cake has baked 30 minutes. Some ovens may bake this cake in less than 45 minutes, but most ovens will take longer. Test with a toothpick. When a toothpick comes out clean then the cake is done. 3) I used a glass baking dish to bake my cake in. Aluminum pans may cook more quickly. Please adjust your time accordingly. DON’T BAKE THIS CAKE STRICTLY BY TIME! 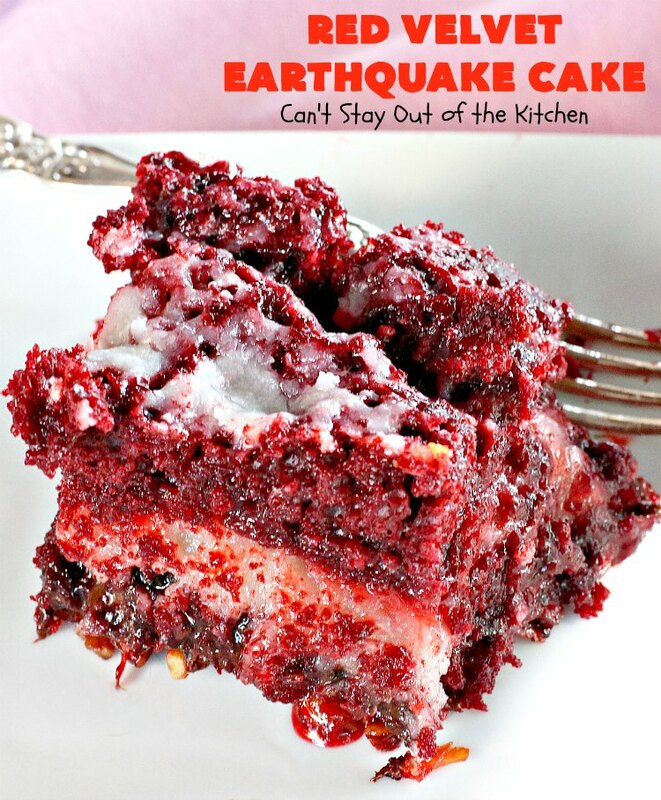 Red Velvet Earthquake Cake is phenomenal! This luscious cake is made with a Red Velvet cake batter, a cream cheese layer, and a layer of coconut, pecans and chocolate chips. Then it undergoes a shift while baking. Everyone will want seconds and thirds of Red Velvet Earthquake Cake. I used these ingredients to make Red Velvet Earthquake Cake. Grease and flour a 9×13″ baking dish really well so ingredients don’t stick to the dish. Spread pecans on the bottom. Top with coconut and then chocolate chips. Follow the directions on the back of the Red Velvet Cake mix adding ingredients required to make the cake: eggs, oil and water. 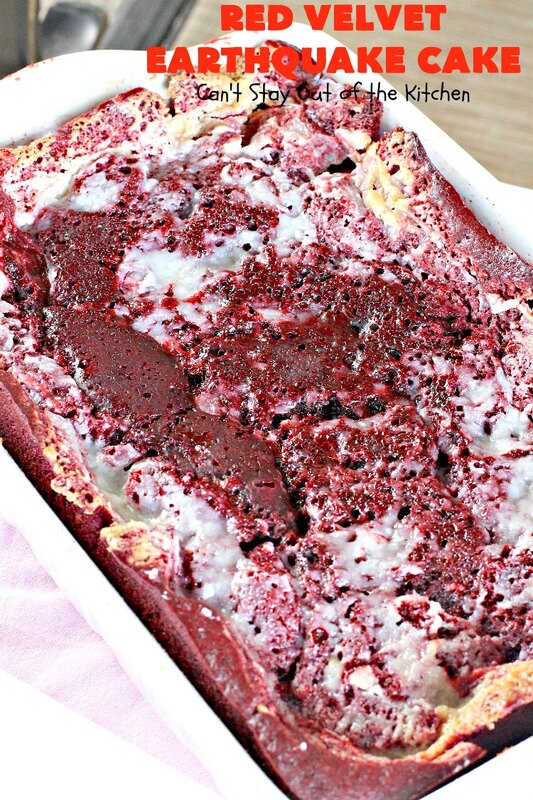 Spread Red Velvet cake batter over top of chocolate chips in baking dish. To make cheesecake layer: place butter and cubed cream cheese in a small saucepan over low to medium heat. Whisk continuously until cheese melts. Remove from heat. Add powdered sugar and whisk until smooth. Spread cheesecake layer over top of cake batter and smooth the top. Bake 30 minutes at 350. Tent with foil. Bake an additional 30-45 minutes or until cake tests done. 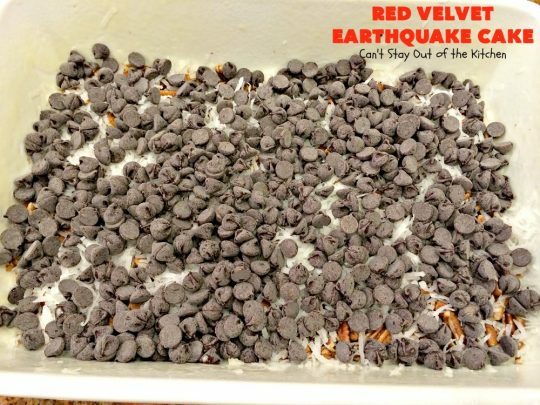 My oven usually takes about 1 hour 15 minutes to completely bake an Earthquake Cake of any variety. 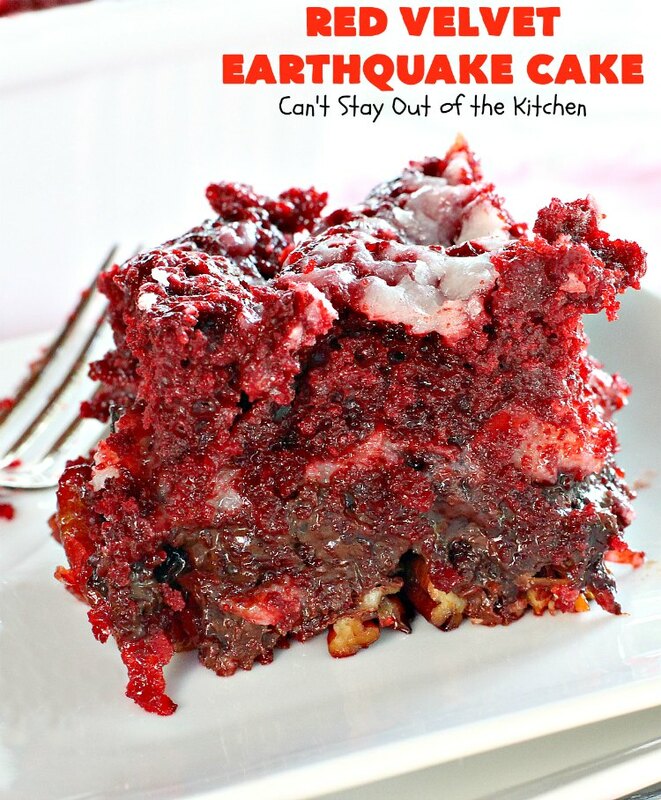 You’re sure to get rave reviews when you make Red Velvet Earthquake Cake. You can see the craters in this cake. The cheesecake layer has sunk into the cake and the red velvet layer has drifted to the top. This delectable cake recipe calls for a Red Velvet cake batter and a cheesecake layer over top of pecans, coconut and chocolate chips. While baking the cake undergoes a seismic shift which explains its name. Fabulous for Christmas and Valentine's Day or other holiday baking. Grease and flour a 9x13” baking dish. Spread pecans, coconut and then chocolate chips in the bottom of the prepared dish. Spread over top of chocolate chips. 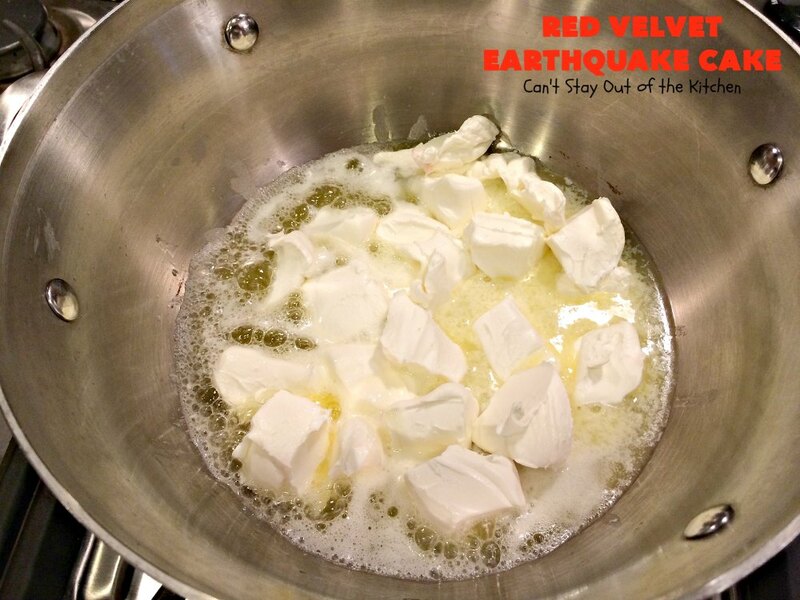 Melt butter and cream cheese over low to medium heat in small saucepan. Add powdered sugar and whisk to combine. Spread powdered sugar mixture over top of cake batter in baking dish. Bake for 30 minutes and tent with foil. Bake an additional 30 -45 minutes or until cake tests done. After 2 days, store in refrigerator. NOTE: My cake mix required 3 eggs, 1/3 cup canola oil and 1 1/4 cups water to make cake according to package directions. NOTE: Hannah said the original recipe called for 1 ½ cups coconut but that it totally overwhelmed the cake so she cut it back to ½ cup. I’ve increased the coconut to one cup for a happy medium. NOTE: My oven took 1 hour and 15 minutes, but the original recipe stated only 45 minutes. Start checking for doneness at 30 minutes. NOTE: You must grease and flour the baking dish really well to avoid sticking. NOTE: This is a rather "high-maintenance" cake as you must tent the cake with foil during the baking so the cream cheese doesn't turn brown. You also have to watch this cake like a hawk to make sure it's cooked through but not burned on the top or bottom. If you oven tends to run hot, you may want to bake this at a lower temperature for as long as it takes. You may have to tent the cake with foil almost the whole length of cooking time if you have a hot oven. Red Velvet Earthquake Cake bakes differently in every oven. I've had people say their cakes were overdone at 45 minutes, and others tell me that their cake took as long as mine to bake - almost an hour and a half. 1) Cover with foil after 30 minutes of cooking time especially if you have a hot oven. This will prevent the cream cheese from browning too much. 4) DON'T BAKE THIS CAKE STRICTLY BY TIME! The time is ONLY a guide. It is better to check the cake every 10 minutes if necessary to achieve the right results. 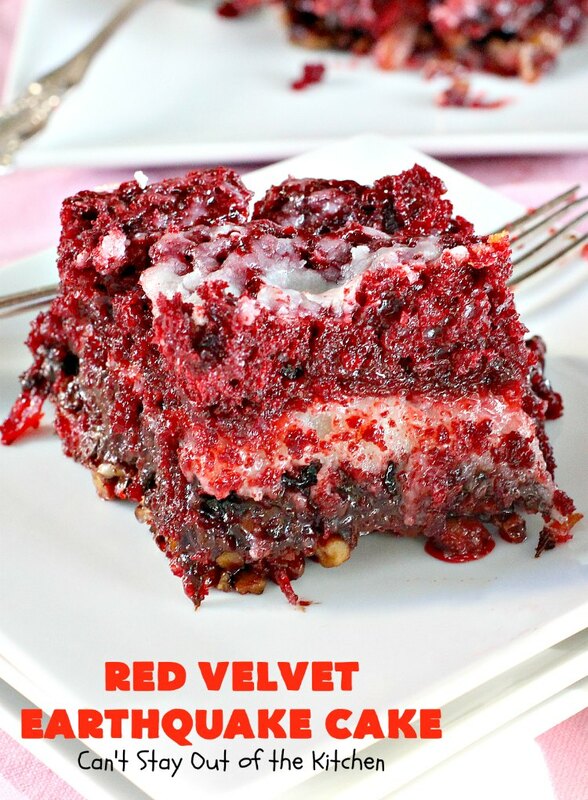 This delectable cake recipe calls for a Red Velvet cake batter and a cheesecake layer over top of pecans, coconut and chocolate chips. While baking the cake undergoes a seismic shift which explains its name. Fabulous for Christmas and Valentine’s Day or other holiday baking. Grease and flour a 9×13” baking dish. Bake for 30 minutes and [u]tent with foil[/u]. My cake mix required 3 eggs, 1/3 cup canola oil and 1 1/4 cups water to make cake according to package directions. [br][br]Hannah said the original recipe called for 1 ½ cups coconut but that it totally overwhelmed the cake so she cut it back to ½ cup. I’ve increased the coconut to one cup for a happy medium. [br][br][br]My oven took 1 hour and 15 minutes, but the original recipe stated only 45 minutes. Start checking for doneness at 30 minutes. [br][br]You must grease and flour the baking dish really well to avoid sticking. [br][br]This is a rather “high-maintenance” cake as you must tent the cake with foil during the baking so the cream cheese doesn’t turn brown. You also have to watch this cake like a hawk to make sure it’s cooked through but not burned on the top or bottom. If you oven tends to run hot, you may want to bake this at a lower temperature for as long as it takes. You may have to tent the cake with foil almost the whole length of cooking time if you have a hot oven. 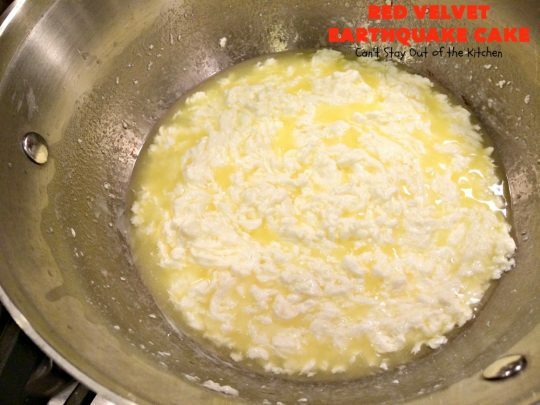 [br][br][b]SPECIAL TIPS:[/b][br]Red Velvet Earthquake Cake bakes differently in every oven. I’ve had people say their cakes were overdone at 45 minutes, and others tell me that their cake took as long as mine to bake – almost an hour and a half. [br][br]If you want to bake this cake successfully and you don’t want it to scorch on the bottom or the cream cheese to brown too much on top, then follow these tips:[br][br]1) Cover with foil the whole length of the cooking time (except the last 5 minutes) especially if you have a hot oven. This will prevent the cream cheese from browning too much. [br][br]2) Start checking your cooking time every ten minutes after the cake has baked 30 minutes. Some ovens may bake this cake in less than 45 minutes, but most ovens will take longer. Test with a toothpick. When a toothpick comes out clean then the cake is done. [br][br]3) I used a glass baking dish to bake my cake in. Aluminum pans may cook more quickly. Please adjust your time accordingly. [br][br][b]DON’T BAKE THIS CAKE STRICTLY BY TIME! [/b] The time is ONLY a guide. It is better to check the cake every 10 minutes if necessary to achieve the right results. Red Velvet Earthquake Cake is a wonderful cake to make for Christmas and Valentine’s Day parties. It’s also a great cake to make for birthdays, anniversaries and other special occasions. Red Velvet Earthquake Cake is filled with coconut, pecans and chocolate chips along with a cheesecake layer that makes it one of the most scrumptious and decadent desserts you’ll ever eat. This sounds amazing! But, I have people that don’t like coconut and people that don’t like pecans. I really want to make this, but can you suggest a variation so that I can still make this? Hi, Jeff. Regarding the nuts, I think you can find another nut that might work well too. Perhaps macadamia nuts or almonds might be worth a try. I’m not sure what to say about the coconut except perhaps tell them to only eat the top part of the cake?? Sorry. Yes, Jeff, you can make them without them. The cake won’t have the full flavor, but it’s still really good. Have you tried making this in a crock pot? I have never tried making this in the crock pot. OMG. I think I need to go to confession. I made this cake on Monday. It’s sinfully good. Easy to make. I baked it for a total of 40 minutes. 20 at 350F, tented with foil and reduced the oven to 325F for another 20 minutes while checking every 10 minutes. Everyone loved it. It’s a keeper. Can anybody tell me whether this cake can be cut into slices, or is more like a dump cake? I am a little skeptical about making it, with all of the negative reviews. Ingredients are expensive, and if it does not come out, I would be a very unhappy person. I had a party for my husband, and took a recipe off the internet blog sites for million dollar bars, and when I went to cut them, before the party, it was like soup. Luckily I had more sweets to serve. You just never know. Cheryl, while this can be a high maintenance cake it is worth it if you’re willing to give it a try. After baking 30-45 minutes (depending on your oven) you may have to tent the cake with foil so it doesn’t over brown on the top. If you cook it long enough it won’t be soupy. On the other hand, it doesn’t need to be overcooked either. Depending on your oven it make take 45 minutes, an hour, or even an hour and 15 minutes to bake completely. The result is an explosion of flavor to die for. Has anybody made this cake yet? It looks really gooey. My question is, can you cut them into squares? Or is it more like a dump cake where you just spoon it out. We have a Labor Day party and I want to make it, but I do not want to bring the rest home. If I can cut them into squares, I can just bring them on a plate and leave the rest for our friends to enjoy. Hi, Cheryl, the cake can be cut into pieces. While it is somewhat gooey, it’s not like a dump cake or a cobbler. Hope you enjoy it at your party. I am not a fan of powered sugar…too sweet . Was wondering if I could reduce the amount (4C) that is combined with the cream cheese..like down to 1/2 cup or even less…. Hi Deb. I think this would totally change the consistency of the cake and it would not be sweet enough. What about using regular granulated sugar instead of powdered sugar? Cut it down to no lower than 2 cups. 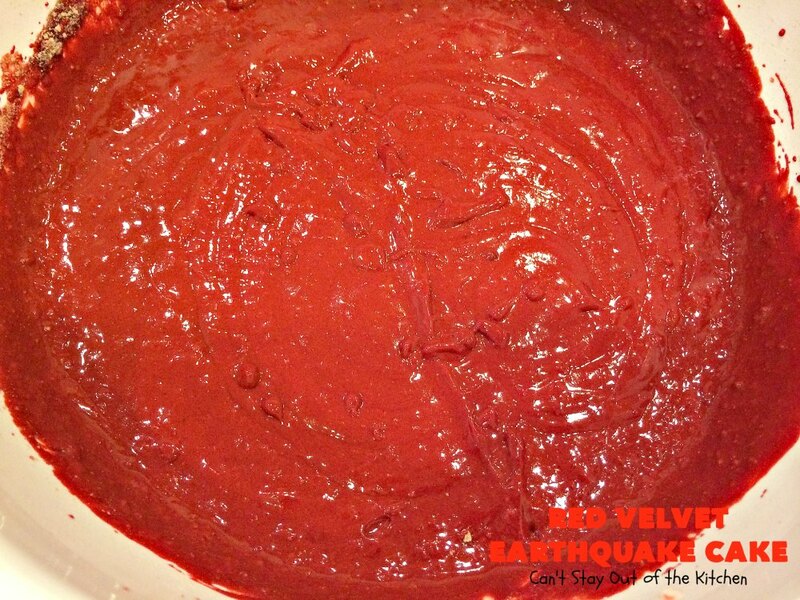 We love the chocolate earthquake cake, but making it red velvet style certainly “takes the cake”! Seriously can’t wait to bake it for a Saturday sweet treat soon! Hope you enjoy. Just remember each oven is different so cooking time can really vary. I am in the process of baking this cake. It smells great! I am a bit worried though. It’s been an hour and 15 mins and it’s still too loose in the center. I wonder if the oven temp could be adjusted as long as we use foil to protect the cream cheese on top? Hi, Tiffany. Yes, you could probably adjust the oven temperature. Make sure the cake is in the middle of the oven rather than too close to the bottom or the bottom will burn. You may just have to take the foil off and cook it and the cream cheese will brown a little. If you’re not concerned about the appearance I’d probably do that. Hope it turns out well for you. It might Gerri, although this was the way the recipe was given to me and I’ve not tried it the other way. My thoughts are, I wonder if it would explode like an earthquake if those ingredients are on top? I think they would weigh the ingredients down so I’m not sure if it would work. If you try it that way, I hope you let me know your findings. I’d love to see a picture, too. If you do layer and cook it tented with foil as suggested, and allow it to cook all the way through (which may take over an hour) it turns out pretty terrific. Thanks for stopping by, Gerri, and thanks for your suggestions. I did, Tara, but if you have a good chocolate cake recipe from scratch you’d like to substitute, I don’t know why that wouldn’t work. Just be careful on your time. Your recipe may have more or less cake batter than the amount used in a cake mix which will definitely change baking times and the texture of the cake. I just have to say that i am obsessed with your site and your recipes and I think you are absolutely a genius and fantastic. i have made many of your recipes and they are always fantastic. I just was wondering if you can half this recipe and use a 9×9? I know you would have to half the cake mix, but i wonder if it would work? You probably really need to watch the bake time? Veronica, you are so sweet and kind. I really appreciate the positive feedback, it’s really a big encouragement to me. I am certainly gratified that you’ve made a lot of my recipes and have enjoyed them. I love to cook and share with others great recipes we have enjoyed so they can enjoy them too. Was so excited to make this cake for tomorrow’s Christmas dinner. Just took it out of the oven at 45 minutes and it is waaaaay overdone. 🙁 Cooking times need to be adjusted downward in a big way. I would recommend cooking the cake for the time recommended on the DH Red Velvet Cake mix box (25-28 minutes), then checking for doneness every 5-10 minutes thereafter. As it stands now, I will have to scramble to make something else my family can eat for dessert. I’m sorry, Amy. This is a high maintenance cake though it is beautiful when it turns out right. Every oven cooks differently. I tented mine with foil and perhaps my oven is slower than yours because it took almost an hour and a half to bake the way it looks in the pictures. The cream cheese topping on mine looks burnt around the edges. I baked it for an hour because it was not done in the middle after 45 min. But it started looking burnt before the 45 min was up. I was watching it thru my oven door. Any suggestions for why that happened. It was on the middle rack of the oven. I would post a pic of what it looks like but I don’t see an option to be able to post one. Mari Beth, This cake has to be tented with foil to avoid the cream cheese from getting too brown. I recommended it by 45 minutes but some ovens could probably stand to have the cake tented with foil after 30 minutes if they run hot. I will make another notation in the recipe for everyone to tent with foil. Even though this is somewhat of a high maintenance cake it is so delicious. I hope the next time you make it, it turns out more to your desire. Good Morning!! I got up early this morning and decided to go ahead and bake this cake. It is out of this world!! I used a glass pan and my oven cooks fast so I baked at 300 degrees, I did the foil after about 45 mins as suggested. Mine took a bit longer to cook and I checked it every 10 – 15 mins just in case. It was a bit high maintenance but I”m oh so glad I took care with it. YUMO (decided to taste a piece before serving to others). It’s sure to become a family favorite, but due to the effort + calories, I’ll only be making this once a year. Thanks for sharing the recipe!! Merry Christmas!!! Oh, Pat, I’m so glad you enjoyed it. It truly is one of those cakes that you have to baby along a little bit, but it is so worth it if it’s cooked properly! Enjoy your Christmas dessert! I have a question. What kind of baking pan should I use. Glass or metal. Susie, I prefer using baking dishes because everything comes out a little easier. But you can use a pan also. Keep a good eye on your time. My oven took almost an hour and a half, but if your oven runs hot this may be done in 45 minutes or less! Go by testing with a toothpick rather than strictly by time. I’m so sorry, Joy. Mine really took that long. I will put a note to check it earlier. Thanks for letting me know. I am so sorry you had a bad experience, Joy. I always use the time measurement as a guide and cook as long (or short) as necessary. I know you must be terribly disappointed and I hate wasting ingredients, too. This cake is so good, I hope you give it another try. Start checking after 30 minutes and every 15 minutes after that until the cake is baked the way you like it. This cake sounds awesome! I have some in my family that don’t like coconut. Could I leave it out. I have never had a red velvet cake with coconut anyway. Caren, this is an earthquake cake with a red velvet flair. It is absolutely fabulous with the coconut, but if you have family that won’t eat it, then I would leave it out. It really is an awesome cake, I’m sure you’ll enjoy it. Just make sure you cook it long enough. Mine took over an hour to cook through, so I had to tent it with foil half way through so it didn’t get too brown on top but not cooked through enough inside. Do you tent when the cake first goes into the oven? Or before the second baking ? Willie, I baked the cake for 45 minutes without being covered. Then I draped foil over top (but didn’t tighten it down), until the cake was completely cooked so that the cream cheese wouldn’t get too brown while baking. As I recall, this cake took a LONG time to bake because it was so gooey. I hope you and your family enjoy it. We sure did.